Ms Brua is the head chef patissier at the three Michelin-starred restaurant Pré Catelan in Paris (pictured, left), headed up by chef Frédéric Anton. She was awarded the Prix Valrhona of Best Pastry Chef (Le Prix Valrhona de Meilleur Pȃtissier de Restaurant du Monde) title by the prestigious restaurant association Les Grandes Tables du Monde, at their 64th conference in Marrakech, Morocco. She won with a creation of apple sugar soufflé, with caramel, cider and popping candy ice cream. Previously, the award has always gone to a man. 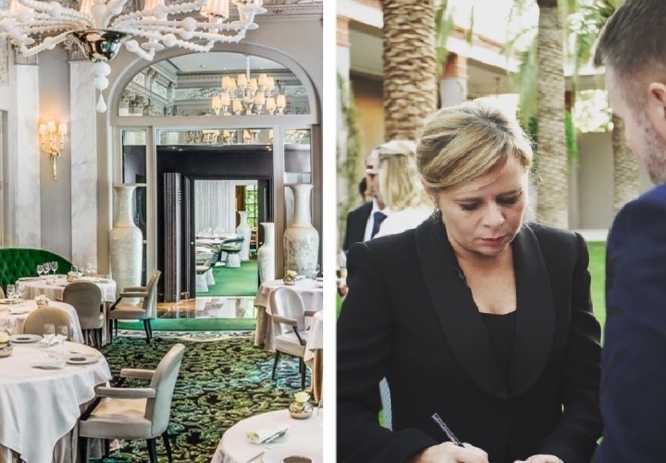 Les Grandes Tables du Monde association includes 174 of the world’s best restaurants from across the globe, adding new establishments all the time. Mr Sinapian is the partner of Anne-Sophie Pic, the only female three Michelin starred French chef. The same event also gave the prestigious Best Restaurateur of the Year award to French chef Paul Pairet, chef-founder of the three Michelin star Shanghai restaurant Ultraviolet. The World’s Best Restaurant Director gong was given to Denis Courtiade, from the Alain Ducasse Restaurant at the Plaza Athénée in Paris; while the World’s Best Sommelier award was given to Giorgio Pinchiorri, sommelier at Enoteca Pinchiorri, in Florence, Italy.